COMPLETE HVAC CUSTOMIZATION AND SHEET METAL FABRICATION. THAT'S SCR. SCR provides comprehensive commercial heating, ventilation, and air conditioning services for customers across Minnesota and the Upper Midwest. We offer cutting-edge technology and energy-efficient systems from industry-leading manufacturers, installed and serviced by experienced, highly-trained technicians. We take HVAC customization to a new level with design/build expertise and a full-service sheet metal fabrication facility. Many customers take advantage of our versatile service offerings and combine our HVAC capabilities with refrigeration, food service, or building automation projects. We’re known throughout the Upper Midwest for not only our scope but our dedication to building long-term, personalized relationships. We strive to thoroughly understand your business and determine the best ways to help you accomplish your goals. 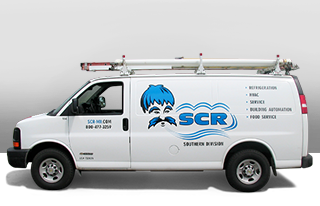 For comprehensive HVAC capabilities, services integration, and turnkey solutions, contact SCR. We had an issue with a HP #17 here at DBL yesterday. Amy did a wonderful job getting a tech scheduled to fix the issue. About 10am, Lee Guggenberger arrived on site. We show him the unit. He fixed the leak on the Freon line. The point I'm trying to make is that he did an OUTSTANDING job and was very quick too. He left the room clean just like it was when he arrived. I was VERY impressed with both Amy & Lee help yesterday! Scott was a delight to work with, and was very patient as we ran around our buildings. In the past, we had done preventative maintenance, but I would say it was more like twice a year. We do not have an actual maintenance person on site, but one of our drivers maintains filters on the units within the buildings on a monthly basis. Our former heating and air technician became unreliable, which is why we came to you. Thank you very much for your prompt attention and the speed in which you had this process move along, it was refreshing. I want to give a sincere pat on the back to Jeremy D for his constant help on numerous occasions and always seeing the issue to the end. I know the issue will get the attention it needs. I have the utmost respect when it comes to refrigeration service technicians everywhere for their dedication to food safety. Jeremy is the best - I so appreciate him! Mitch arrived here at Ridgeview Place to do a routine job. However, we eagerly awaited his arrival as he was coming to repair our broken ice/water machine. It was over 100 degrees three days that week and we were desperately wanting our machine repaired. When Mitch arrived that day (one day earlier than we expected! ), he was very pleasant. He asked if where he was parked was ok – this is huge! We are an assisted living community and often repair vehicles are in the way of our turn around. Mitch was parked in the regular lot and made several trips in the very hot weather to ensure he was not to inconvenience our tenants from coming and going. It was inconvenient for him! He communicated effectively and worked diligently to have our machine repaired before the next meal. Mitch touched bases before he left as well to ensure all our needs were met. I didn’t know Mitch before that day, but I will not forget him. He was thoughtful, patient, courteous, caring and did his work efficiently. I would highly recommend Mitch to all your jobs but especially to your senior living communities. I wish all our vendors would be as respectful and courteous as Mitch! Your employee Justin came over and solved the issue in minutes. We had two other companies come in and neither solved the problem. Justin is a very nice young man that does a great job and comes across very pleasant. We were very happy and impressed with our recent maintenance performed by SCR. The technician was "busting his hump" and did an astounding job. Very friendly and open when explaining the issues as well as the resolutions. What an excellent service team you have put together for your Central Food Service division. Our school district had been a customer many years ago, and decided to try SCR again for a compressor we were having problems with. From the first contact with Rebecca Dombrovski to our onsite interactions with the service tech Craig, the communication was thorough and quick, follow-up was swift and clear, we were scheduled quickly, explanations and options were clear and thorough, and our site and personnel were treated respectfully. They, and you, are to be commended for providing such a great customer experience. We will definitely be continuing our relationship with this service department and recommending them to colleagues as well.